The news has been saturated with talks of China and the U.S.
Amid the trade war between the two world powers is a hidden battle over the future of one of the most disruptive technologies of our time: artificial intelligence (AI). 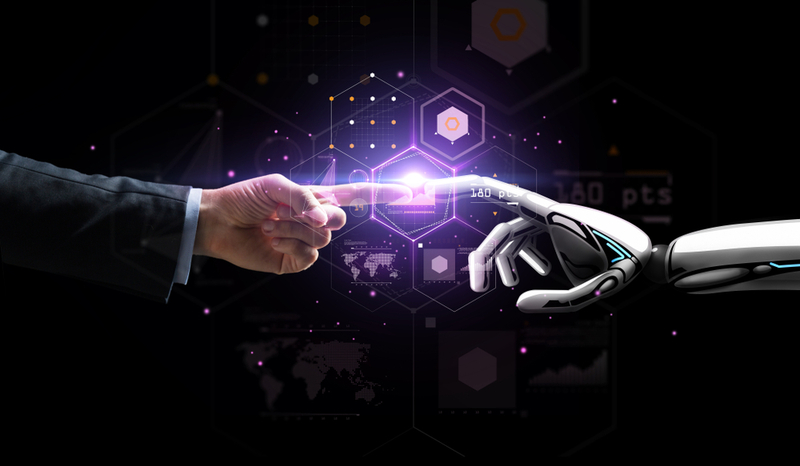 Recently, the World Intellectual Property Organization published a study showing that the two nations dominate the AI space. For example, International Business Machines (NYSE: IBM) – which I covered last week – has more than 8,900 patents related to AI, which gives it the biggest patent portfolio among institutions globally. Last week, I explained why I believe IBM is a good buy right now. It’s entering a period in its revenue cycle that typically hands investors the strongest gains in the company’s fiscal year. I also believe IBM – and other companies – is a great way to play the emerging AI wave that’s taking over many sectors. Second to IBM is Microsoft (Nasdaq: MSFT) – currently the most valuable company in the U.S. – with more than 5,900 patents. But China’s presence in the AI space is just as impressive. The study found that Chinese organizations make up 17 of the top 20 academic institutions in AI patenting. Use of AI is becoming widespread and more pervasive than many realize. Just last week, The New York Times reported that U.S. businesses have been using spy satellites to monitor the manufacturing output in China. They’ve done so because the Chinese government has stopped reporting key metrics in an attempt to obscure its economic slowdown in the midst of the ongoing trade war with the U.S. In an effort to gain an information advantage, a San Francisco-based firm called SpaceKnow has been using high-altitude surveillance imagery to track the health of local factories in the Chinese province of Guangdong. These images are analyzed using SpaceKnow’s “geospatial analysis engine.” It’s a machine learning program that can track and monitor everything from car and airline traffic to shipping vessels, agricultural development and even manufacturing activity. This technology is just one of the many ways AI is making use of big data to solve real-world problems. Another example is healthcare, where machine learning is being heavily applied to both diagnostics and treatment development. Health professionals are now able to identify patients with higher health risks by using predictive diagnostic tools. This technology can also detect early indications of some diseases, including cancer. 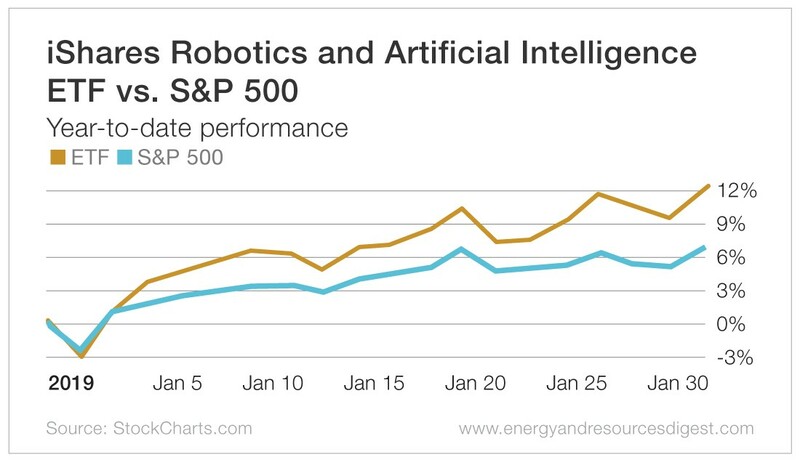 One way for investors to play the AI boom is through the iShares Robotics and Artificial Intelligence ETF (NYSE: IRBO). This ETF (exchange-traded fund) tracks the global companies involved in both robotics and AI. These companies must earn at least half their revenue from operations related to those technologies, dominate at least 20% of the industry’s market share, or have $1 billion or more in annual revenue. The ETF delivered a more than 12% gain in the month of January, greatly outpacing the broad market, as tracked by the S&P 500. The biggest drivers of those gains have been tech players like Cloudera (NYSE: CLDR) – up more than 20% year to date – and CEVA Inc. (Nasdaq: CEVA), up 29%. But a more aggressive, albeit speculative, way to trade the boom is with a leveraged play. 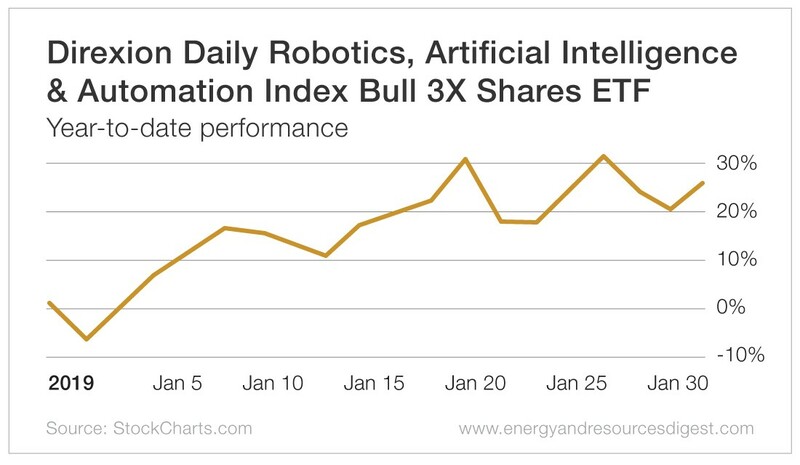 The Direxion Daily Robotics, Artificial Intelligence & Automation Index Bull 3X Shares ETF (NYSE: UBOT) is another play that adds three times leverage to magnify daily returns of its underlying stocks. The Direxion ETF is also up big for the year… by twice as much as the iShares ETF and more than three times the performance of the broad market. So keep an eye on AI… It’s definitely here to stay.